In December 2015, the Federal Aviation Administration (FAA) announced a new interim final rule that for the first time imposed regulation on the operation of unmanned aircraft systems (UAS) as model aircraft. In the name of a safe national airspace, the new regulations require operators of drones weighing more than 250g (0.55 pounds) to register with the agency. Yet many drones weighing more than 250g are little more than toys. Do they really pose a risk to the airspace? 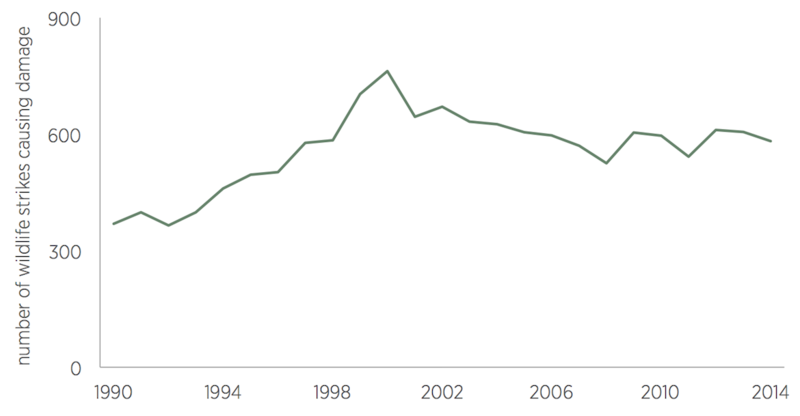 To explore this question, we examine 25 years of data from the FAA’s wildlife strike database. Although aircraft collide with birds many thousands of times per year, only a tiny fraction of those collisions result in damage to the aircraft, much less human injuries or deaths. The most serious reported incidents typically involved flocks of large birds. Since the addition of UAS to the airspace is similar in many respects to an increase in the bird population, we conclude that the risk to the airspace caused by small drones (for example, weighing up to 2kg, or 4.41 pounds) flying in solitary formation is minimal. US national airspace is home to an estimated 10 billion birds, some of which occasionally interfere with civil aviation. To track the risk this wildlife poses to human flight, the FAA has been collecting reports of aircraft collisions with wildlife in the National Wildlife Strike Database since 1990. Strike reporting is voluntary. When a wildlife strike occurs, airlines, airports, pilots, or other parties report the incident through an online portal, with data about the aircraft, the flight, the species of wildlife struck, and extent of damage caused. Compared to the enormous population of birds, damaging bird strikes are rare. Since 1990, there has been a sevenfold increase in reported bird strikes owing both to growing bird populations and to the growing ease of reporting strikes online. But as figure 1 shows, strikes causing damage have actually declined from a peak of 764 in 2000, thanks to bird management efforts from airports. Specifically, airports have mitigated bird hazards by focusing on eliminating natural attractants of the large bird species that are responsible for the most serious incidents, like waste disposal areas and wetlands. Source: Federal Aviation Administration, Wildlife Strike Database. When large birds are ingested in jet engines, they may cause substantial damage, including crashes. While these birds do not number in the billions, they still maintain a significant presence. The US is home to nearly 1.9 million turkey vultures, for instance, and between 2 to 3 million snow geese enter the United States each winter. Contrary to sensational media headlines, the skies are crowded not by drones, but by fowl. Figure 2 illustrates that while the FAA has recorded over 160,000 wildlife strikes since 1990, only 14,314 bird strike incidents have resulted in damage. Of these, 80 percent were caused by medium- to large-sized animals. On average, only 3 percent of reported small-bird strikes ever result in damage, compared to 39 percent of large-bird strikes. 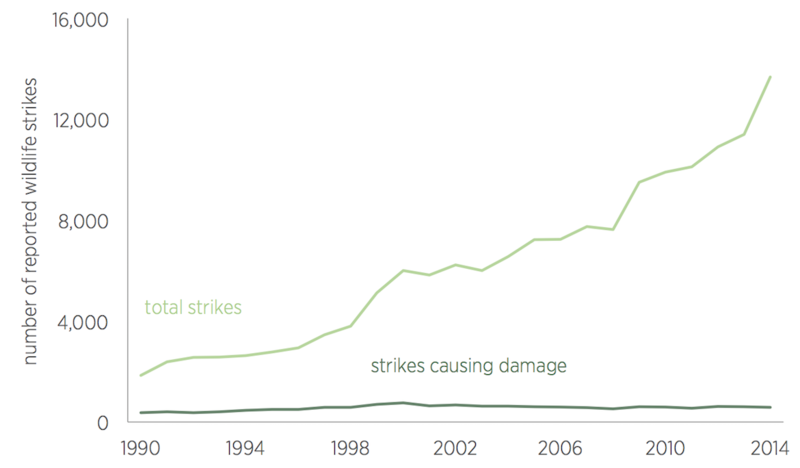 Given the voluntary nature of strike reporting, the true percentage of strikes causing damage is probably much lower, as strikes that do not cause damage can be either missed or underreported. 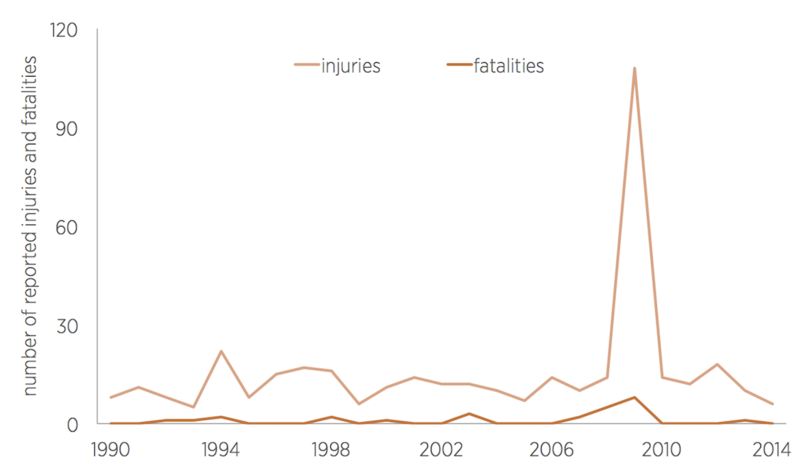 Injuries are even less common. Among the 398 people who have sustained injuries as a result of bird strikes, 100 stem from a single incident: the famous 2009 crash of US Airways Flight 1549 into the Hudson River. This spike can be seen in figure 3. Prototypically, the culprit was determined to be a gaggle of geese, an unknown number of which were sucked into both jet engines immediately following takeoff. In total, there have been 238 wildlife strike incidents in which there were injuries or fatalities. To get an idea of how many of these affect commercial aviation, we can exclude incidents in which the operator is listed as “business,” “privately owned,” “government,” or “unknown” to narrow the total number of commercial incidents to 37. We should view these 37 incidents over more than 25 years in the context of approximately 27,000 commercial flights per day. Although the number of reported bird strikes has increased substantially since 1990, the increase is probably due to the improved ease of reporting. 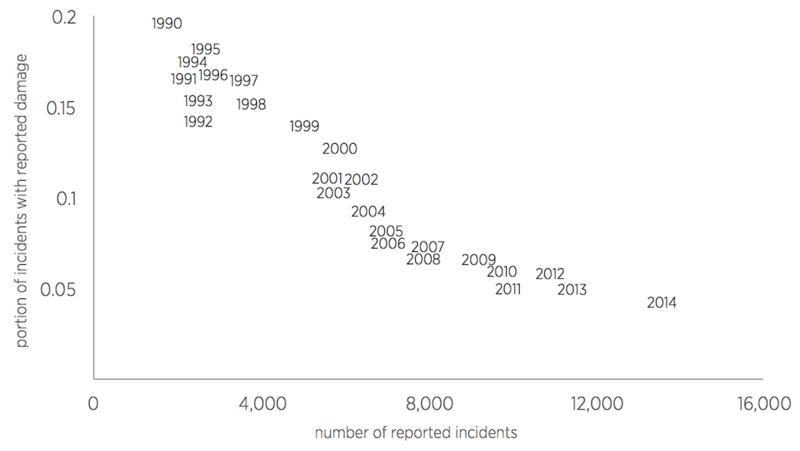 Figure 4 shows over time both an increase in the number of reported wildlife strikes and a decrease in the proportion of reported incidents with reported damage. This is consistent with the hypothesis that in the early part of the observed period, reports were frequently not filed at all if there was no damage to the aircraft. For our econometric analysis of the probability of a strike causing damage or injury, we focus on the years 2009 and later to compensate for the effect of limited participation in reporting in earlier years. 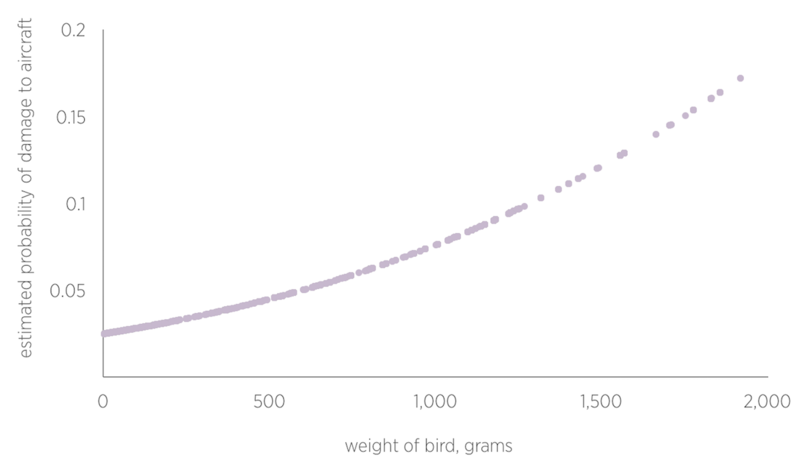 We use probit regressions of casualty and damage reports on bird species weight for birds (and flying mammals) for collisions taking place in 2009 or later with a single animal to estimate the probability of casualty or damage conditional upon a strike with an animal of a certain weight. Figure 5 shows our estimate that damage to an aircraft will occur in around 20 percent of strikes with animals weighing around 2kg. And in figure 6, we further estimate that the probability of the incident resulting in passenger injury or death is about 0.2 percent for animals weighing around 2kg. Note: This chart uses data from 2009–2015 only. Bird strikes provide an excellent parallel phenomenon for estimating the magnitude of damage a small UAS could cause by colliding with a manned aircraft. But as previously mentioned, without an estimate of UAS strike frequency, the magnitude of damage is insufficient to properly gauge risk. The size of the effect has to be multiplied by the chance of it actually occurring. In 2014, there were 13,414 reported collisions with birds and flying mammals, counting incidents in which flocks of birds hit an aircraft as a single collision. As there are on the order of 10 billion birds in US airspace, this means that plausibly 1 bird in 1 million collides with an aircraft every year. Even if we take UAS operators to be about as deliberate and skilled at avoiding aircraft as birds, we cannot similarly estimate that 1 UAS in 1 million UAS will collide with aircraft every year. Not only are UAS operators able to reason about human-piloted aircraft and airfield landing patterns better than birds are, UAS have very short battery lives and may sit idle for months at a time. In contrast, an observational study of bird behavior near wind turbines found the average bird spends roughly equal amounts of time flying as perching. Flight time is much more variable, however, with some migratory birds potentially flying as long as six months nonstop. FAA commonly refers to “acceptable risk levels” for general aviation in terms of fatalities per 100,000 flight hours. 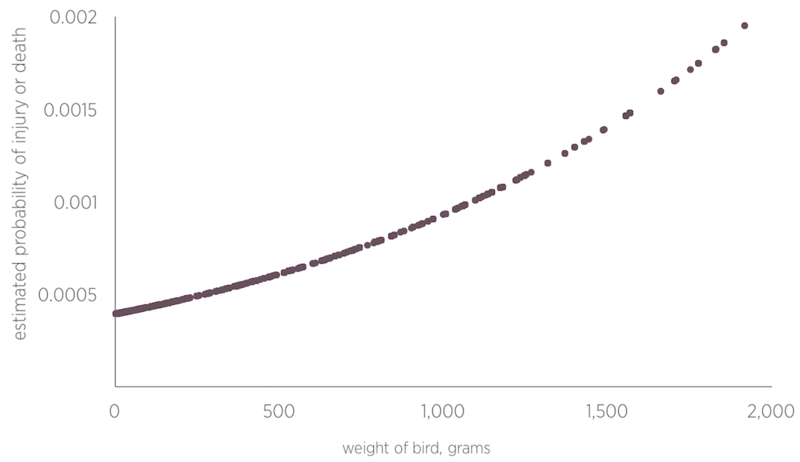 Using the aforementioned finding that birds spend roughly half their lives in flight, the fact that there were 13,414 bird strikes in 2014, and an estimate of 10 billion birds in US airspace, we estimate that there are 3.06x10−5 bird strikes (both damaging and not) per 100,000 bird flight hours. This risk level is comparable to the 5x10−5fatality risk cited by the drone registration task force as acceptable for general aviation, without even adjusting for the probability of injury or fatality. To date, no commercial drone or consumer quadrocopter has ever collided with an aircraft in US airspace. Given that there are likely now more than 1 million UAS in US airspace, if they had equivalent flight hours to birds we might expect at least one UAS collision with an aircraft per year. However, taking into consideration human agency and the far more limited time most UAS spend in the air, the true UAS collision rate is likely orders of magnitude lower. In a 2015 investigation, the Academy of Model Aeronautics (AMA) called the validity of these near miss reports into question. Of the 764 near miss incidents recorded by the FAA, the AMA found only 27, or 3.5 percent, were genuine UAS near misses. Instead, the FAA had been counting simple sightings as near misses—even when the operators were fully compliant with current UAS regulation. The FAA has also counted several cases where the pilot had explicitly reported that it was not a near miss, and more than a dozen cases where the flying object was officially unidentified. The AMA therefore accused the FAA of creating fuel for sensationalized and inaccurate media reports which, with the benefit of hindsight, helped build momentum for its rulemaking. Our analysis has been based on actual bird strikes, not near misses or simple sightings. We find in general that small UAS under 2kg pose a negligible risk to the safety of the national airspace. We estimate that 6.12x10−6 collisions will cause damage to an aircraft for every 100,000 hours of 2kg UAS flight time. Or to put it another way, one damaging incident will occur no more than every 1.87 million years of 2kg UAS flight time. We further estimate that 6.12x10−8 collisions that cause an injury or fatality to passengers on board an aircraft will occur every 100,000 hours of 2kg UAS flight time, or once every 187 million years of operation. This appears to be an acceptable risk to the airspace. Our analysis has some limitations. First, birds and UAS are composed of different materials, so it is possible that UAS-aircraft collisions are more likely to cause damage or casualties than bird-aircraft collisions. Although the FAA requires jet engines to undergo bird strike tests, it does not require them to undergo UAS strike tests, so it is not possible to empirically assess the additional degree of damage potentially caused by more rigid materials. Second, our assessment of the damage and casualties caused by birds has focused on incidents in which aircraft collide with individual birds, as opposed to flocks of birds. The rationale for this decision is that UAS do not typically fly in flocks, and therefore, collisions with individual birds provide a better point of comparison. However, if swarms of UAS were to become an increasingly common operational pattern, one would want to revisit our analysis to account for that fact. Since the probability of any collision with any UAS is around 3.06x10−5 per 100,000 flight hours, countries that have even higher cutoffs for regulation than 2kg can be said to be acting responsibly. For example, the United Kingdom and Denmark have a 7kg threshold above which recreational UAS operators must inform their nearest air traffic controller or fly in an approved flying site. For registration, France recently moved to a 2kg threshold, while Canada still has a generous 35kg threshold. Although UAS at the above thresholds are more likely to cause damage and injury than the 250g cutoff adopted by the FAA, we still estimate that the probability of a collision remains at an acceptable level.